- sounds catchy maybe there's a song with that title. 1. 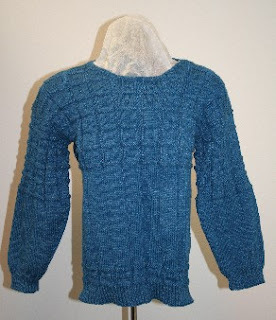 When I had decided to knit Dunbar for my husband I remembered that he liked very traditional sweaters that were not too long with ribbed bands at the waist and neck. This should not be too difficult; should it?....I measured the "model" did a swatch and cast on. 2. With some twists and turns I finished the sweater to the shoulders and tried it on said model - alas - too short. Some how over the 20 something years of our marriage he has managed to stretch out of shape every sweater he has ever owned and as a result he has decided that the "long stretched look" is what he really likes. 3. OK I can cut off the ribbed band at the bottom and knit down an inch or two. Well this would have been much easier, if I had not decided that I had to break the boredom of the plain knitting with a purl stitch every 11 stitches. 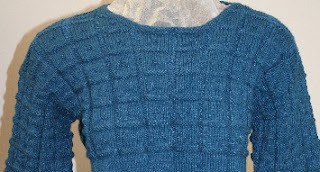 So now I had to insert a panel of the pattern to lengthen the sweater. Fine, but it was not really what I had set out to do. 4. Finally the sleeves. I have only myself to blame here. I did not realize how long 5 repeats of the pattern would work at the top of the sleeve. It really is too long compared to the body of the sweater. Plus the sleeves should have the pattern band at the cuff to match the main pattern band. So we back up - rip out the sleeves to eliminate the last two pattern repeats and add a repeat before the cuff. It does give me a chance to improve the sleeve decreases which became a little untidy where the ribbing for the cuff starts. In the meantime, I have begun my 4th gansey - one with horizontal panels - Pictures soon.